You may take feverfew for a migraine or black cherry syrup for a cough, but do you know how these plant medicines are helping you? This is a tricky question, and there are lots of different ways to answer it. Depending on who you ask, you may hear that chemical constituents in plants catalyze certain reactions in the body. This is the same model by which the scientific community understands pharmaceutical actions. There is nothing wrong with answering the question this way. However, humans have been using plants to heal and prevent disease for millennia. Long before anyone understood anything about chemical constituents, herbalists knew which plants treated which disease. How did they obtain this knowledge? It would have taken countless attempts to figure this out by trial and error. Without advanced equipment to analyze chemical make-up or even biological classification, they must have been able to gather information using just their senses, information that gave them an understanding of plants’ medicinal qualities. In Chinese medical herbalism, herbs are understood to be medicinal because of their directionality. This may seem like a foreign concept; how could a dried plant part have a direction? It has a direction in the sense that, when ingested, it tends to move a certain way. For instance, take coffee, one of the modern world’s most beloved plant medicines. We drink coffee to help us get up and out of bed. This is not just word play; the up-and-out directionality of coffee can be felt in the increased activity, talkatively, creativity, and productivity that occur when we drink it. Herbs not only have directionality, they also are a direction. Our physiology reacts to them in the way that it does because the herbs represent an instruction communicated to the body. They demonstrate to the body a course to take, or in short, they direct it. 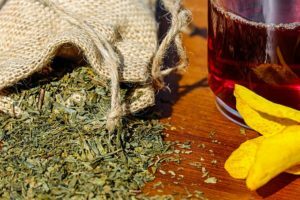 The healing power of this emerges when an herb, which has directionality, is taken by someone who is suffering from an illness, which also has directionality. Anxiety has an upward movement; depression has a downward direction. Nausea, dizziness, and insomnia move up; diarrhea, fatigue, and organ prolapse move down. Simply, pathologies that have an upward directionality are treated with herbs that have a downward directionality, and vice versa. In addition to up and down dynamics, there are also inward and outward vectors, and everything in between. It is rare that an herb or a disease has only one direction; like most things, herbs and diseases exist in infinite varieties. These can be thought of as the languages it uses to convey its direction to the body. In this system, there are five flavors – sweet, sour, pungent, bitter, and salty – and five temperatures – hot, cold, warm, cool, and neutral. Each of these qualities has its own direction, so in combination they make up the direction of the herb. We all know that taste can have a profound effect on how we feel. Probably the most universal example of this is the light, happy feeling that we get from eating something sweet. What stops a toddler’s temper tantrum more effectively than a piece of candy? (And what incites it more swiftly than the denial of said candy?) No wonder the majority of our nation is addicted to sugar. Understanding how an herb affects the body is no more complicated than this. The flavor of an herb, combined with its temperature, moves the body along a particular vector. If we use the word “center” to refer to the zone of good health, pathology would be when we are either to the left, right, or otherwise out of that zone. Prescribed accordingly, herbs help us heal by guiding us back into the center zone, and their ability to do this comes from their inherent directionality. This directionality is not only accessible to our senses when we ingest, or taste, an herb, it is also expressed in every aspect of a plant’s being. It can be seen, smelled, felt in a tactile way, and even heard. You are probably familiar with cinnamon, or Gui Zhi in Chinese. This medicine has a strong outward directionality: it takes the body’s energy and disperses it out to the surface, warming and stimulating the outermost layer. This is why it excels at resolving a cold at the early onset, because it helps create a strong defensive effort at the gateway of the body, where external pathogens are invading. What we know as cinnamon comes from the inner bark of a tree in the Cinnamomum genus. It is literally a part of the outer layer of the plant, reflected in its medicinal effect on the surface of the human body. If you smell cinnamon, you can immediately feel that it is a moving herb. It may even induce a feeling of prickliness in your nose, or bring on a sneeze, indicating its outward directionality. Just by observing this plant with our senses, we are able to gain an understanding of its healing properties. 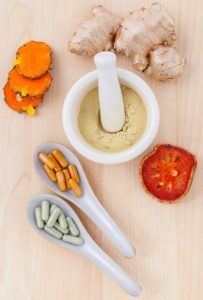 How herbal medicine works is neither a great mystery, nor a process that can only be understood by chemists and pharmacists. Like most things in nature, it is both simple and complex, and available to our knowing if we are willing to sensitize our awareness. Alexandra Ricketts, LAc, is a Chinese medicine practitioner at Heart Spring Health in Portland, Oregon. She loves helping her patients find deep relaxation and optimum health using acupuncture, herbal medicine, and bodywork. To learn more about Alexandra’s offerings, visit www.heartspringhealth.com and www.wellspirithealth.com. Call 503-956-9396 to schedule an appointment at Heart Spring Health’s natural medicine clinic. This entry was posted in Chinese Herbal Medicine, Portland Natural Medicine and tagged chinese herbal medicine, chinese medicine practioner in Portland, portland herbal medicine.